Great delivery and a great product. The Presto Bed Frame provides style and durability. Bed frames have remained basically unchanged for thousands of years. But the world is about to change, thanks to the revolutionary Presto Bed Frame. The stylish and exceptionally strong Presto Bed Frame goes from a 2-foot box to a bed like magic. 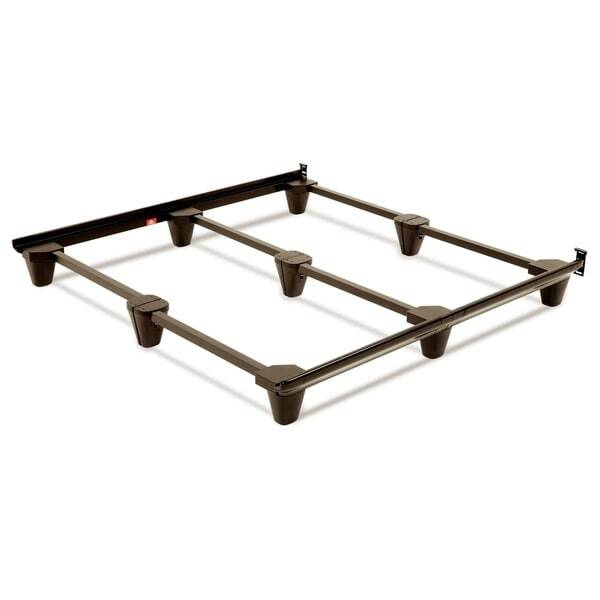 It assembles in less than one minute and adjusts in seconds from Full to Queen to King to Cal King, making this a frame a simple and practical mattress support system. Durable 9-leg design supports up to 2,000 lbs. Warranty: Limited Lifetime Warranty against manufacturing defects. Dimensions 74.0 In. X 77.75 In. X 10.25 In. I couldn't be happier with my purchase of this "Fashion Bed Group Presto Universal-Sized Folding Bed Frame". The ingenious design adjusts to fit full, queen, king, or California king foundations. My old queen-size bed frame had (6) legs where this frame has an amazing (12) and the frame is high enough so I can slide my hard shell rifle cases underneath. Setup is quick and easy and you'll only need tools to fasten the headboard to the frame (Typically this requires 4 bolts, 4 nuts, 8 flat washers and 4 lock washers). It is a strong, well-built and attractive frame that should last a lifetime. I highly recommend. Ordered this bed frame and completely loved it. Very sturdy, packaged perfectly and super easy to assemble. Loved the fact that the legs are wide and thick. 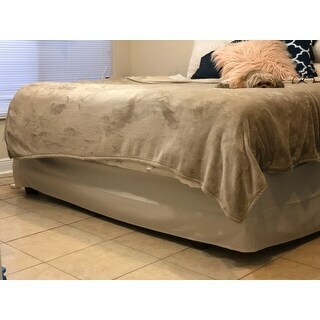 They do not stick out like other bed frames - this is awesome as you will not stub your toes when walking close to the bed. We recently also added wood flooring and the legs Although super sturdy are also gentle enough on out flooring. The color and design are absolutely perfect and beautiful. The bed frame also pairs perfectly with any standard bed headboard. The best bed frame you could ever purchase. EASY to put together and VERY high quality. True to it’s specs, the frame is very heavy duty, even through the parts itself are very light and easy to carry. It has a nice modern/low profile look that worked well with my Macy’s mattress and box spring. I have owned this frame for a while now and would say it surpasses any frame you could get at a mattress store. Thank you Overstock for carrying this item. I am super happy with this purchase and would highly recommend. Best bed frame ever! So easy to put together, and very sturdy. Our king mattress feels much more supportive. It took me 10 minutes to put this frame together for my King size bed. I love this frame. Best purchase I have made in a while. I told my husband I would put it together for him, ( I had read reviews on how easy it was to install) he laughed. I had it together in 10 minutes. He was amazed when he came into the bedroom. He said order another one for upstairs. It is strong, looks good and slides on carpet with out too much effort. I loved the first one so much that I purchased another. These people cornered the market on bed frames. Easiest thing to put together. I am a 70 year old woman and put it together in 15 minutes by myself. You don't screw or nail anything. It made to fit inside itself and it is very sturdy and slides on carpet when you push it. Don't let this one go!!! Very nice look in the mahogany color, good quality and super easy to put together. I am using it with a queen, but would feel secure using it with the larger sizes as well, the support in the middle really stabilizes it. I would definitely recommend this. I love it!!! It was super easy to assemble, It only took me 30 seconds. I highly recommend it!!! Had I known about this bed frame before, I would of never waste so much money on others. I love it!!! My product was received within the time frame expected. It took me less than 30 minutes to put it together. No tools involved. Very sturdy, and I am pleased. I would highly recommend this product. Nice and sturdy bed frame. Macy's wanted to charge me $300 for the same one. In love. Super quick setup. Only took one episode of golden girls. I’m looking like a grown up with my mattress off the floor. Quick shipping. Easy setup! Great product! I replaced an older universal metal Hollywood frame with this one. It has metal an plastic, but the plastic is solid and strong. It was super easy to attach the two long sides to my headboard and then add the crossbeams after. It's great. "Is it possible to attach a footboard to this frame? If so, can the additional hardware be purchased?" A footboard cannot be attached to this frame. "Where can I purchase the headboard shown with this bed frame?" It can be found under item number 14279933. "I am looking to replace the current platform wood slats for my king mattress. The high is 5 inches off the floor. Since this foundation support is 10 inches off the floor it will increase my low-profile platform bed by 5 inches unless I can order this system to replace my 5 inch box spring as well. Will I still need a box spring or is this capable of handling the mattress alone." While we list the Presto bedding support product as 10 1/2" high, that is to the top of the decorative side rail. The supporting pieces to this frame are the standard height of all bedframes - that is, 7 1/2" off the floor. It is designed to ONLY be used with a foundation or boxspring, not a mattress only. Looks good and has excellent reviews. I already purchased this item, showed it to a friendand at the current price ordered one for her as well. This is a great frame. "about the Headboard Bracket, do you have to have the Headboard Bracket ???????" The bedframe has the headboard bracket permanently attached to the side rails.